Tu ayuda y retroalimentación son bienvenidos. Por favor consulta la página del Equipo de Traducción. fomentar nuevas tecnologías que ampliarán el acceso, mejorarán la calidad y reducirán los costos asociados a proveer educación, principalmente a través del uso de contenido de libre acceso. El señor John Daniel, Presidente y CEO de la Commonwealth of Learning es el patrocinador de WikiEducator. El proyecto ha adoptado un modelo de gobierno comunitario el cual es coordinado por la International Advisory Board provisoria. Los auto proclamados ambassadors for WikiEducator promueven el proyecto alrededor del mundo, y nuestro technology roadmap nos ayuda a hacer realidad el futuro. La infraestructura técnica de Wikieducator es apoyada por la Commonwealth of Learning (COL). La COL es una organización intergubernamental creada por las naciones miembros de la Commonwealth (conocidos como Commonwealth Heads of Government) para motivar el desarrollo y el uso compartido de aprendizaje abierto (open learning), así como conocimientos, recursos y tecnologías basados en la educación a distancia. La COL ha invertido considerables recursos del presupuesto del programa en construir capacidad para conteido de desarrollo libre, lo que se hace más notable a través de la iniciativa de la Universidad Virtual para Pequeños Estados de la Commonwealth (VUSSC). WikiEducator aims to build a thriving and sustainable global community dedicated to the design, development and delivery of free content for learning in realisation of a free version of the education curriculum by 2015. 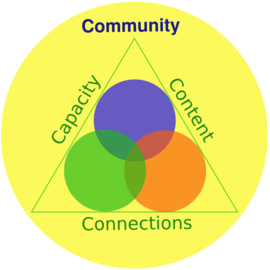 Building the capacity and skills of the community to engage meaningfully in the mass-collaboration required for the design and development of high quality learning resources, for example capacity building workshops. Developing free content and knowledge to support the development of open communities and free content developers so that resources can be reused in multiple contexts, for example the Newbie Tutorials. Ensuring smart connections through appropriate networks, ecosystems and the smart implementation of free software solutions to fill the gaps between existing mainstream technologies and the unique requirements of asynchronous learning thus widening the reach and access of free content in the developing world. This is achieved through community nodes on WikiEducator (e.g. FLOSS4Edu), technology think tank meetings (e.g. Tectonic Shift Think Tank) and fostering strategic relationships with the freedom culture (e.g. Wikiversidad and the WikiMedia Foundation). The strategy is divided into three distinct phases. strategic relationships networking to ensure the right connections for a sustainable community. Policy and practice guidelines for the design and development of learning content drawing on the research and experience of distance education, for example the Learning Design project. Establish quality assurance mechanisms appropriate for educational content, for example implementation and refinement of the FlaggedRevs initiative. Development and implementation of a fund raising strategy for the WikiEducator community. Seeding the establishment of regional and national chapters of mainstream WikiEducator initiatives. Ongoing refinements to existing technologies and the search for free software solutions to scale up the rate of free content production. The purpose of this phase is to prioritise activities which implement free content into mainstream educational activities. The success of the free content movement in education will be measured when real students enroll in real programmes using free content. The flagship project will be the Commonwealth Computer Navigator's Certificate to collect evidence on the merits and value proposition of free content in real educational contexts. WikiEducator was established as a collaborative authoring environment to support VUSSC and COL's eLearning initiative. A review of WikiEducator's early history shows exponential growth with numerous free content initiatives emerging around the world. Sir John Daniel announces the development of the Commonwealth Computer Navigator's Certificate to coincide with Software Freedom Day, 12 September 2006. The Open Education Content project commences on WikiEducator, 21 September 2006. WikiEducator's brochure is produced and available for download (899KB), 25 October 2006. The East African Chapter of the FLOSS4Edu project was launched during the Open Education Resources Workshop, November 2006. Esta página fue modificada por última vez el 1 ago 2010, a las 05:52. Esta página se ha visitado 28 245 veces.